Published by Ian Allan Publishing. First in a new series, this uses the same paperback format and size as the well-established Osprey series though it has twice as many pages and takes a different approach to the subject. The vehicle chosen to start things is Germany’s Pz IV which was used throughout World War 2 and even beyond, serving in small numbers in Syria into the 1960s. Although maybe not as immediately appealing as the later Tigers and Panthers, this tank was used on all fronts literally from the early days until the end, being continually improved to keep pace with its opposition. The book covers only the gun tanks themselves and not the specialised versions like the self-propelled guns which used the same chassis. As such there is plenty of space to deal with the vehicle in great detail. Text starts by covering the development of the tank from the pre-war days of the "Battalion Commander’s Vehicle", describing each successive mark and how it differed from its predecessors. Photos show each mark, some images are heavily retouched recognition shots though good enough to tell the marks apart. Chapters then cover the hull, fighting compartment and armament illustrated using detail photos. I suspect these came from the in-depth examinations of tanks captured in North Africa and taken to England for inspection. These were written up at the time as School of Tank Technology Preliminary Reports Nos 7 and 14 but these only contained part of the information discovered. What this book does is to give photographic coverage of the inside of the vehicle and includes detail close-up photos showing final drives, engine, fan drives, the original L/24 short gun separated from the tank and even the inside of the gearbox, final drive and turret rotary junction. Also covered are early and late pattern idlers, suspension units with even a view of the suspension from under the vehicle, as well as the cupola in several photos. Line drawings show the air flow through the radiator, sections through the vehicle, armour plate thickness and ammunition stowage. A scale plan depicts an Ausf D while perspective drawings show details of later marks. Final section is less well detailed. It covers markings but only in a general way, describing the varieties of Balkenkreuz and turret numbering systems along with illustrations of all Heer and Waffen-SS divisional markings. Vehicle colours are only mentioned in passing. Most photos are black and white, there are several colour shots of the Bovington Tank Museum’s Ausf D reworked to later standards in both its current markings and those applied before it was repainted, while two colour plates illustrate various the markings as appropriate. 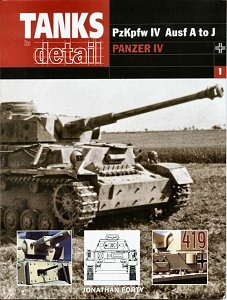 At first sight, this looks like a very detailed book and there is a lot of material for someone wanting to build a model Pz IV. Detail photos are very good and fine in their own right, but looking more closely there are problems. The internal details show early marks better than later ones, so would be best for modelling an Ausf E or even a D though some photos show a G. The short KwK37 L/25 series gun is described as a "Sturmgechutz" when this name was applied to the self-propelled gun not the cannon. Markings details add little to the coverage when there is so little on colour schemes which is very misleading and what is there often contradicts more recent research. Small errors have also crept in, while the Ausf G is miscaptioned on page 54 as a C is a simple misprint the "extended gunner’s periscope" on the vehicle in the photo on page 52 is not a standard item but was only fitted to the Panzerbeobachtungswagen IV. All-steel roadwheels were not a feature used on gun tanks, being designed for the front-heavy Jagdpanzer versions. And surely someone at the publishers could have weeded out a shot of a Pz III on page 87 which is included. Generally, this book has its merits but while it may show the vehicle itself in detail especially inside, some of the background information looks outdated and as such it should not be taken as a main source. However, taken as is it should be a useful additional book for modellers interested in this widely-used tank. For information on ordering this book and others, see the www.ianallansuperstore.com web site.